Homeowners take great pride in maintaining a well-trimmed and beautiful garden thanks mostly due to the best wood chipper they use. Keeping your garden free of dried leaves, branches and other debris is not as easy as it may seem. The amount of waste the trees and plants in a garden can generate is simply huge. Adding fresh mulch to improve the appearance of the soil or just wanting to clear away the fallen branches, having a chipper shredder is very useful. The electric garden tool operates with the help of a robust motor of 14 amp generating about 4300 revolutions a minute. The chipper mulcher can reduce limbs and sticks of about 1.5 inches in thickness. It is ETL approved and has a 2-year full warranty. The device does not have any settings to adjust the size or speed. 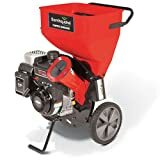 If you are environment conscious and want to reduce your carbon print as much as you can, purchasing the Greenworks wood chipper shredder may be a good idea. 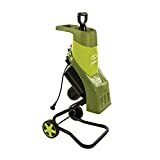 The tool provides good quality that ensures your lawn work gets done in record time so you are left with lots of free time to spend during your weekend. The electric chipper shredder does not need any maintenance or tune-ups as in a gas powered model making it an ideal choice whether you use it regularly or occasionally. Has a push paddle that allows feeding of debris into hopper simple and safe. The leaf mulcher is fitted with a motor of 13 amp that is capable of efficiently turning 53 gallons of leaves into mulch in a minute with an rpm of 8500. Since it has a high rpm, it generated huge amounts of dust so you need to use a face mask and eye protection while operating it. Tired of clearing away heaps and heaps of leaves and other lawn debris every day? 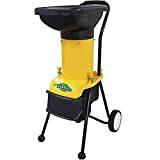 The Sun Joe electric leaf shredder and mulcher may be a good option for you. 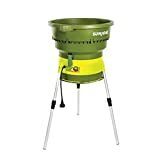 Sun Joe leaf shredder can effortlessly shred huge amounts of leaves and convert them to nutrient-rich compost that you can recycle and reuse in your garden. Are you looking for a quality electric chipper shredder to make your own nutrient-rich compost for your garden? The Eco-Shredder electric chipper may be an effective way to save time, effort and money. The eco shredder has good wood chipper reviews. Side chute can handle branches that are about 13/8 inches in diameter. If you want your yard clear of leaves and other debris quickly and efficiently, the Flowtron leaf shredder is a great choice. The branch shredder and mulcher can clear your curb in a breeze. Best of all you can save on trash bags and disposal fees as the design minimizes waste into manageable mounds that you can reuse and recycle. The unit is very light in weight weighing just 17lbs. The motor is protected thermally and against overload making this unit a best electric wood chipper. 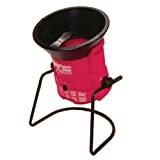 The loading funnel is extra-large in size about 21 inches in diameter making loading a breeze. It is made of polyethylene and is of high density. If you are in search of a compact yet effective chipper shredder for your small yard, the Tazz K33 chipper shredder may be a good fit. The compactly designed yard chipper packs an amazing performance. The design is 50 State Compliant. Overhead design of valve makes the unit cool, clean and fuel efficient. The hopper cannot accommodate crooked and bent branches. When your garden is generating huge amounts of organic waste, you need a handy and efficient chipper shredder. 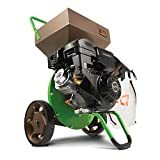 Choose from the above list of the best chipper shredder for home use to keep the plants and trees well-trimmed and save on money and effort. A chipper shredder is best for gardens that need to be free of tiny branches, leaves, and other waste easily and effectively.